In May of this year, I had the great fortune to take a few days and travel along Highway 101 from Northern California up the entire length of the Oregon Coast. This afforded me several fantastic bird watching opportunities, which began one morning at Humboldt Bay National Wildlife Refuge (a bit south of Eureka). With only a few short hours to commit, I took the Shorebird Loop trail; the loop is 1.75 miles, if you don’t count all the back-and-forth on segments where one has to move around for just the right angles. 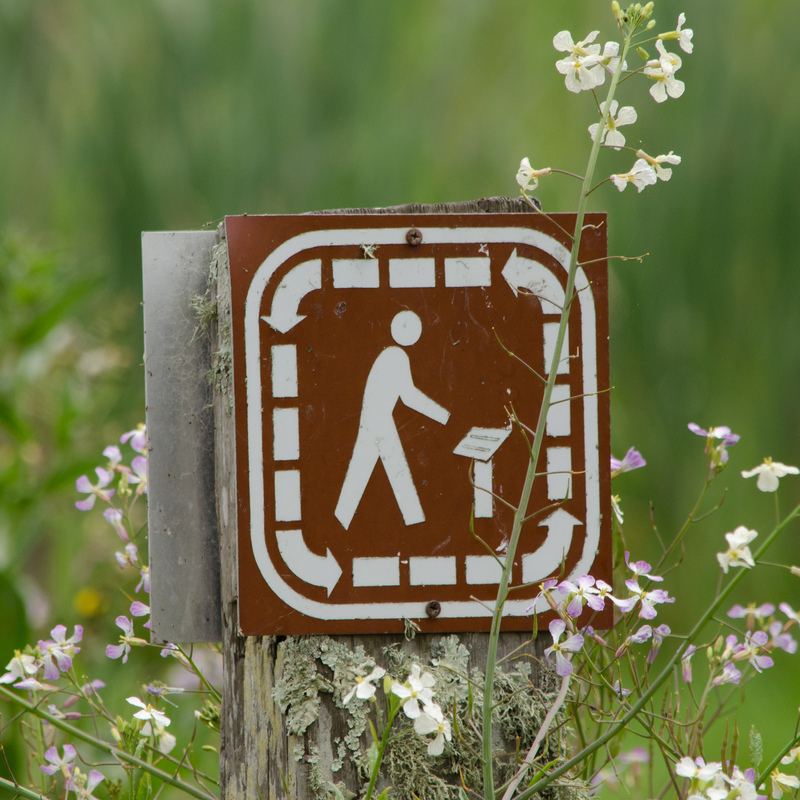 The trail leads through a variety of marshes and then open fields, looping around Long Pond before coming back. 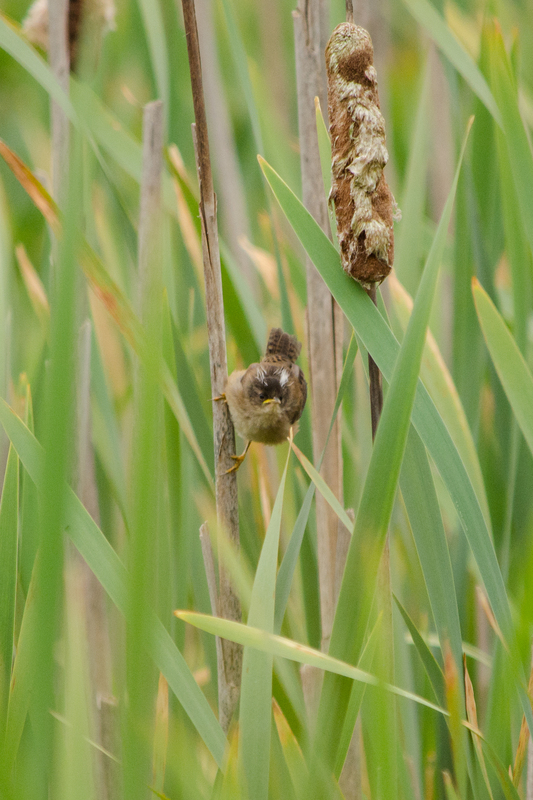 The very first thing noticed setting out was the cheery chorus of marsh wrens among the endless reeds. These tiny birds clearly had the area surrounded, but it took time to spot them. Birds of prey were spotted in the distance, the huge wings of turkey vultures and what at first I thought I was the familiar silvery male Northern Harrier. 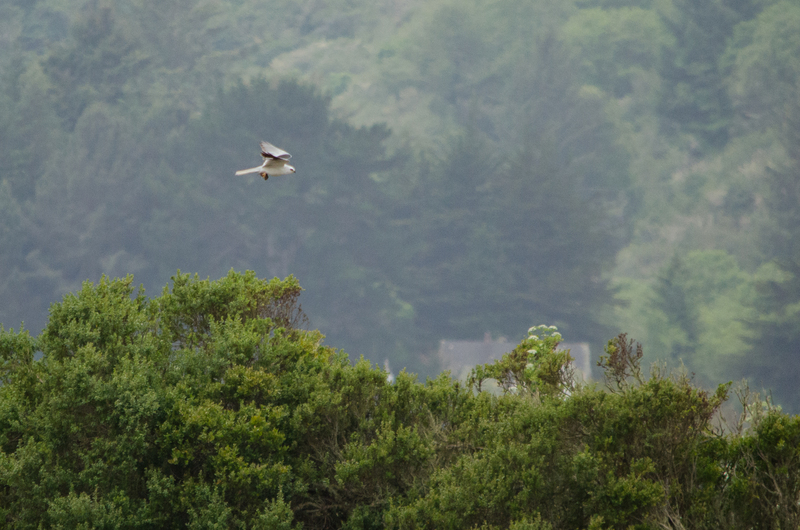 It took me a moment to realize this was something different: a white-tailed kite, new for my life list! The predator had breakfast in its talons and took to a distant perch to dine. It was a reminder to not take familiar impressions for granted in new territory; I’d missed the chance for better shots thinking it was a bird I knew. 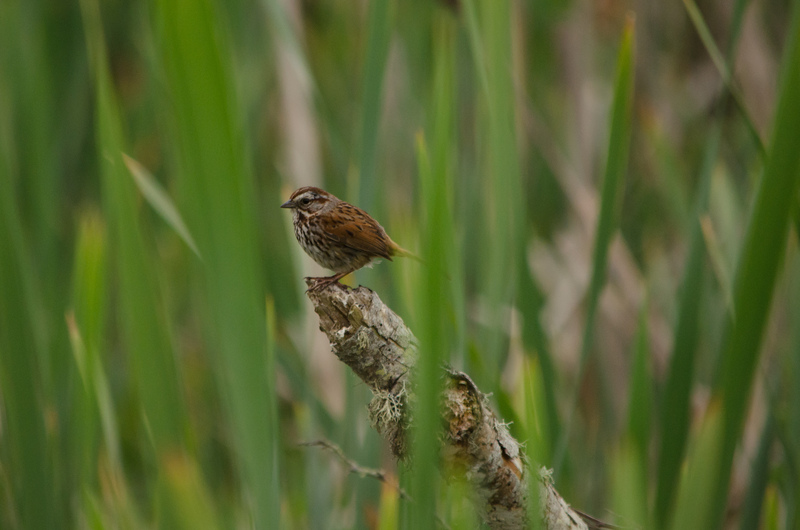 Song sparrows mixed with the marsh wrens, and I noted that the coloration of this familiar species was darker here than my stomping grounds back near Portland. Regional variations were added as another thing to be wary of on my mental checklist. 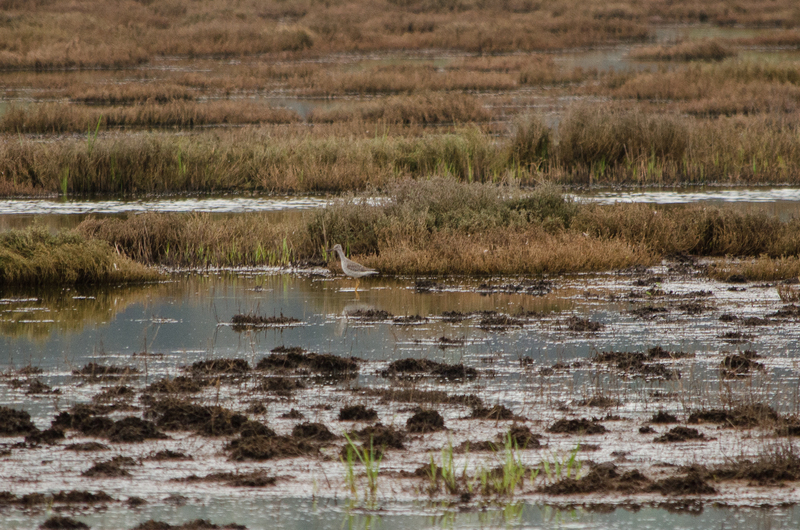 Out on muddy flats near the pond, a tall shorebird wadded through the muck. There are two types of yellowlegs, incredibly similar to each other: the greater and the lesser. After staring at the few pictures I took of this individual, who did me no favors by neither calling nor feeding so I could note sounds or behaviors reliably, I’ve decided this is a greater yellowlegs. This is based on long bill length, with a slight upturn, and barring on the flanks. I also encountered individuals in flight which revealed molting on the wings, which as I understand at this time of year only happens with the greater (lessers molt after migration). Coming around the pond, several common ravens were engaged in nest raids among the spring grasses and wildflowers. 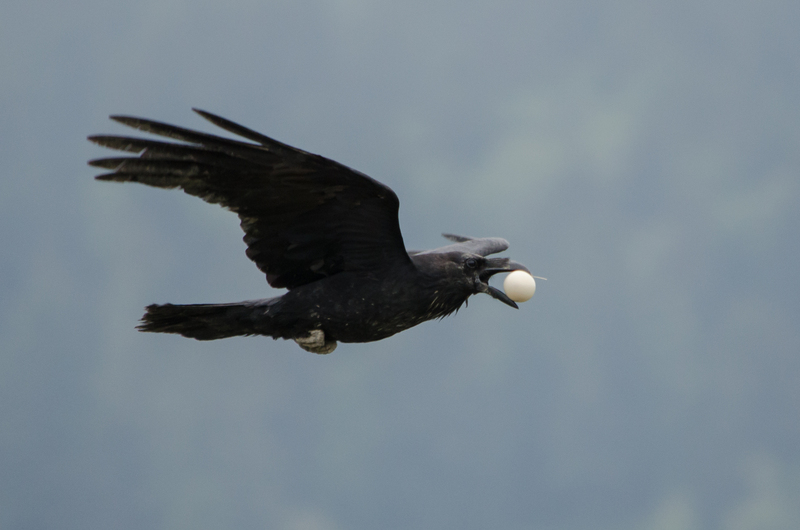 Snatching up eggs, they would fly a distance away to break the shells to get at their meal. They had to be quick, before one of their own companions would come and try to steal their prize away. 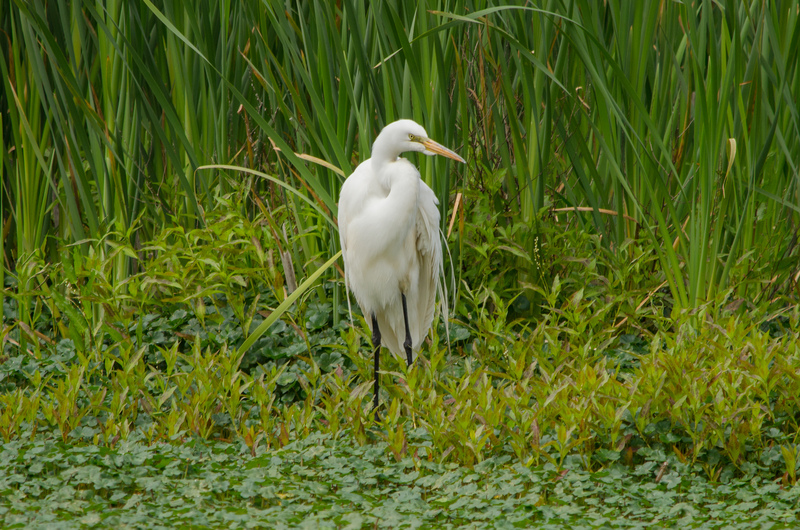 Moving back through the marsh, a great egret was near a boardwalk deck, surveying the area. Tall and graceful, the bird’s white plumage cut a striking figure amid the vivid greens of spring. 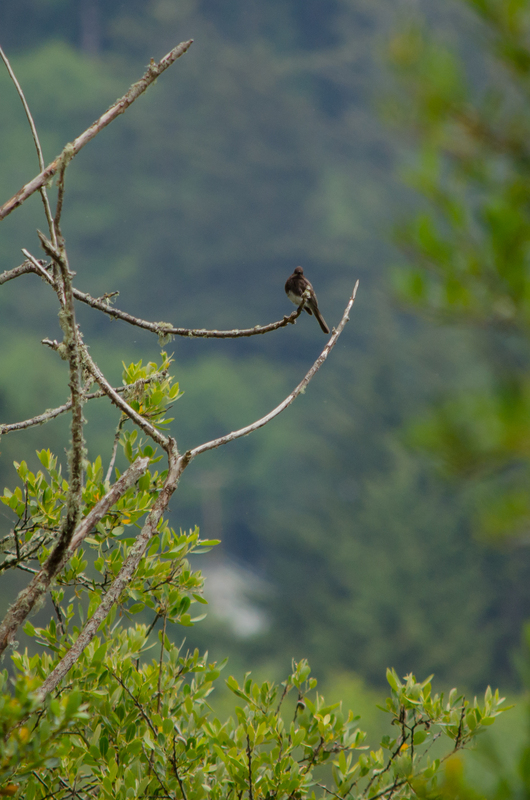 From a covered lookout, I spied a black phoebe sitting characteristically on a branch out above the water. Every few moments, the bird would fly out after an insect before returning again to its same perch. Another new bird for the list. Humboldt Bay NWR is a location I would have loved to have more time to explore; there are other trails and other units of the refuge to be wandered. I encountered three new birds for my life list, and a total of six for my 2015 list – a very good start to the Highway 101 road trip! Other birds encountered included great blue heron, European starling, red-winged blackbird, savannah sparrow, mallard, northern harrier, Canada goose, American goldfinch, house finch, tree swallow, barn swallow, and American coot.